Nancy W. Sindelar, Ph.D. has spent over 30 years in education as a teacher, administrator, university professor and consultant and has published numerous articles and three books on educational topics. She works with schools across the country in the areas of standards-based curriculum and assessment alignment, collection, use and interpretation of student test data, teacher mentorship and the development of high performing teacher teams. By focusing on data-driven instruction, Nancy has helped schools move from state academic “watchlists’ to “most improved status,” based on state test scores. Nancy’s Hemingway biography, Influencing Hemingway, was inspired by her background in teaching. She states, “As a former English teacher at Hemingway’s alma mater, Oak Park and River Forest High School, I first explored Ernest’s high school years as a means of engaging my students in his novels. I studied Ernest’s yearbooks, his high school writing and even met some of his former teachers. Together my students and I learned that the man who became an international literary figure and sports legend also was an avid reader, a high school athlete, the editor of the school’s newspaper, a contributor to the literary magazine and that he played the cello in the school’s orchestra and participated in the school play.” After additional research, including trips to France, Switzerland and Cuba, Influencing Hemingway was written to document how Ernest Hemingway’s early years and the people and places Ernest was drawn to in his adult life contributed to his thoughts, actions and writing. 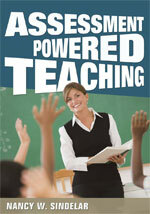 Dr. Sindelar works with schools across the country in the areas of standards-based curriculum and assessment alignment, collection, use and interpretation of student test data, teacher mentorship and the development of high performing teacher teams. 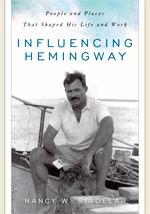 Influencing Hemingway documents how Ernest Hemingway's early years and how the people and places he was drawn to in his adult life contributed to his thoughts, actions and writing. Sindelar's popular presentations to audiences of all sizes include rare photographs and excerpts from the author's personal letters.